Dozens of employees gathered on Friday to celebrate two important milestones achieved by the NIF & Photon Science (NIF&PS) Directorate‘s and Weapons and Complex Integration (WCI) Directorate’s Target Fabrication team. Target Fabrication Manager Alex Hamza welcomed the crowd and kicked off the celebration by announcing the first of the milestones: This summer, the target fabrication team built the 10,000th target for the Omega Laser Facility at the University of Rochester’s Laboratory for Laser Energetics (LLE). Target Fabrication Manager Alex Hamza welcomed the crowd and kicked off the celebration by announcing two important milestones. “When I think about NIF, the two things that always come to my mind is the incredible engineering that happens on a large scale and on a small scale. Of course, today we are celebrating the small scale with targets. But the other thing is the partnerships,” said Jeff Wisoff, principal associate director for NIF&PS. The second milestone announced by Hamza was the completion of the 500th cryogenic target for NIF. This is an important achievement because these millimeter-sized targets are complicated engineering marvels in tiny packages — so complicated that targets were produced at a rate of one per year when the capability first got off the ground in 2005. A beryllium capsule in the hohlraum of a keyhole shock-timing target. Keyhole experiments measure the strength (velocity) and timing of the shock waves from the laser pulse as they transit the capsule. The viewing cone for the Velocity Interferometer System for Any Reflector (VISAR) diagnostic, shown mounted above the hohlraum, is inserted through the side of the hohlraum wall and into the capsule. Design and fabrication is so complex because the precision required to perform under the extreme conditions experienced during an experiment on NIF — temperatures of 180 million degrees Fahrenheit and pressures of 100 billion atmospheres. Components must be machined to within an accuracy of 1 micron (1 millionth of a meter) and many material structures and features can be no larger than 100 nanometers, which is just 1/1,000th the width of a human hair. The capsule must have a smoothness tolerance approaching 1 nanometer, 1/100,000th the thickness of a human hair. Because surface debris can interfere with the uniformity of capsule heating and compression, dust particles greater than 5 microns in diameter on the capsule wall must be eliminated. Finally, the target temperature is held in the range of 18 to 20 kelvins (-427 to -424 degrees Fahrenheit) just before the laser shot so that an incredibly smooth and uniform solid hydrogen fuel layer can be formed. Many different target designs exist — for stockpile stewardship purposes, high-energy-density science and more. Today, the target fabrication team has the capability to produce 5-6 cryogenic targets per week and to produce more than 100 different types of targets each year. Des Pilkington, leader of WCI’s AX Division, was on hand to speak to one of those partnerships. In 2013, Lawrence Livermore National Laboratory (LLNL), through Lawrence Livermore National Security LLC (LLNS), was awarded more than $45 million to develop and deliver a state-of-the-art laser system for the European Union’s Extreme Light Infrastructure Beamlines facility (ELI-Beamlines), under construction in the Czech Republic. Thomas Manzec and Marc-Andre Drouin, from ELI Beamlines, work on synchronizing the HAPLS and ELI timing systems. Photo by Jim Pryatel. The ELI Beamlines facility is being built on a brownfield site with sufficient infrastructure. According to the current zoning plan, the area can be used for public amenities, science and research. It is therefore a place that provides enough space both for the laser center, as well as for any other building of similar use (technology park buildings, spin-off companies or other research facilities). When commissioned to its full design performance, the laser system, called the “High repetition-rate Advanced Petawatt Laser System” (HAPLS), will be the world’s highest average power petawatt laser system. Nearly a year into the project, much progress has been made, and all contract milestones to date have been delivered on schedule. Under the same agreement, ELI Beamlines delivers various work packages to LLNL enabling HAPLS control and timing systems to interface with the overarching ELI Beamlines facility control system. In a collaborative effort, researchers and engineers from LLNL’s NIF & Photon Science Directorate work with scientists from the ELI facility to develop, program and configure these systems. According to Constantin Haefner, LLNL’s project manager for HAPLS, this joint work is vital. “Working closely together on these collaborative efforts allows us to deliver a laser system most consistent with ELI Beamlines facility requirements. It also allows the ELI-Beamlines team to gain early insight into the laser system architecture and gain operational experience,” he said. This summer, that process began. Marc-Andre Drouin and Karel Kasl, control system programmers for ELI, spent three months at LLNL working with the HAPLS integrated control system team. During their time at LLNL, they focused almost exclusively on the ELI-HAPLS timing interface, which allows exact synchronization of HAPLS to the ELI Beamlines master clock. Haefner pointed out that while HAPLS is a major component, it becomes a subsystem when it moves to the ELI facility. Once at ELI, HAPLS will integrate with the wider user facility, consisting of target systems, experimental systems, diagnostic systems – all of which have to be timed and fed from a master clock. Kasl likened the master clock to a universal clock used by an office. “We brought the clock here, and now everyone in the office is using the clock to synchronize their work,” he said. The master clock, built by ELI, was programmed as a bridge between the ELI and HAPLS timing systems. During their time at LLNL, Drouin and Kasl worked on configuring that hardware and writing the software that talks to the clock and to the subcomponents that control a very precise sequence of events. 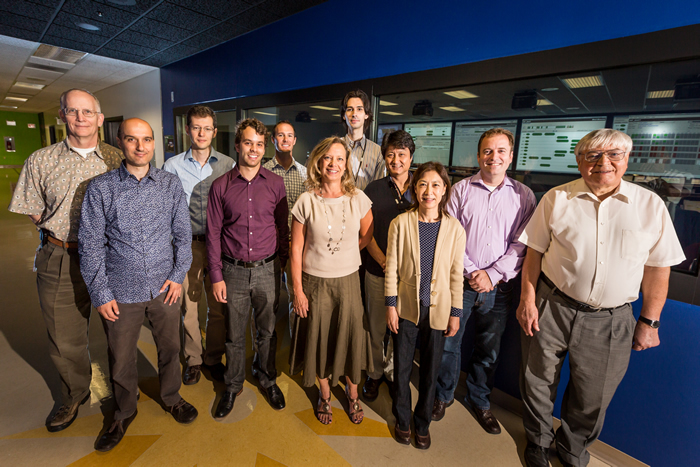 Last week, the ELI team finished their three-month stint at LLNL, but will be back in early fall to continue work – and they’re looking forward to it. “This unit is going to get integrated with our other systems, so there needs to be an overlap between the two teams,” Kasl said. Earlier this year, Jack Naylon and Tomas Mazanec, also from ELI, visited LLNL to contribute to the work. The first NIF Discovery Science experiment designed to create and study fully formed collisionless shocks, such as those responsible for the properties of many astrophysical phenomena including supernova remnants, gamma-ray bursts, jets from active galactic nuclei, and cosmic ray acceleration, was performed on July 29. Collisionless Shock Target and Schematic(Left) The collisionless shock target, consisting of two opposed nickel/iron-doped deuterated plastic (CD) discs; plasma from the discs is accelerated by 28 NIF beams each to counterpropagate and interact at high velocity. (Right) Schematic of the 60 beams interacting with the target and the resulting plasma interaction: 28 beams (150 kJ) on each target plus four full aperture backscatter station (FABS) probe beams to measure stimulated Raman scattering. The ACSEL collaboration is led by LLNL, Osaka University, Oxford University, Princeton University, and MIT, with many other universities participating. The ACSEL Campaign TeamMembers of the ACSEL Campaign Team (from left): Bruce Remington (LLNL), Gianluca Gregori (Oxford University), Anatoly Spitkovsky (Princeton University), Frederico Fiuza (LLNL), Channing Huntington (LLNL), Peg Folta (NIF User Office), Matthew Levy (LLNL), Youichi Sakawa (Osaka University), Hye-Sook Park (LLNL), Steven Ross (LLNL), and Dmitri Ryutov (LLNL). Heesun Wee. Additional reporting by Brad Quick. Consider a supercomputer so fast and powerful that it generates simulated models to better understand everything from irregular human heartbeats to earthquakes. 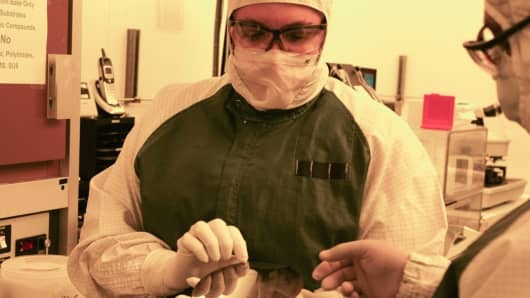 Picture tiny brain implants that can restore sight and possibly memory. Or what about the world’s largest laser, with powerful beams, zooming rocket-like across three football fields—research that could lead to future sources of clean energy? This is the world inside the Lawrence Livermore National Laboratory, a national security lab 50 miles east of San Francisco. National labs have been around for decades and are commonly associated with nuclear weapons testing. But inside Livermore’s mile-square campus, some 6,000 employees hover over hundreds of projects that span multiple industries, including oil and gas, health care and transportation. Livermore, like other labs, often collaborates with private companies to create solutions such as more fuel-efficient, long-haul trucks, and more resilient airplane components. The lab secured $1.5 billion in funding from multiple sources last year—the majority from the government. But in recent years, companies have been ponying up more money. Private industry contributed about $40 million for research at Livermore in 2013. “That will continue to go up,” said Richard Rankin, director of the lab’s industrial partnerships office. Labs also are emphasizing they’re open to collaboration. And part of the courtship can be explained by the growing complexity of modern problems. Think cyber and chemical warfare, or securing future energy supplies as climate change barrels down, or treating and managing more American soldiers, returning injured without limbs. Just as major energy companies have worked together to drill ever deeper for offshore oil, leading government-funded labs and companies are realizing they can’t go it alone. As the world becomes a scarier place, competition also is growing for brain power to solve the most pressing problems. In Silicon Valley, for example, a top science degree means options—research labs of your choosing, maybe an Apple gig, maybe a founding role at a start-up. But globally, there’s also demand for talent and big ideas—an innovation arms race, if you will. Lawrence Livermore has the world’s third-fastest supercomputer with the help of IBM. But China now holds the number one slot. And while the Livermore Lab has the world’s largest laser, France, China and Russia are pursuing super lasers of their own. Don’t laugh at this “mine is bigger, better, faster” game. Initial breakthroughs in science and technology can lead to patent-related revenues, of course. But first-mover advantages can also help secure medicine such as a cancer treatment or an Ebola vaccine. And there are national security consequences to such information. Just recall the 2011 film “Contagion” and the loss of social order, as a coveted vaccine is administered. You can see how this stuff might play out. This push to innovate or embrace the “art of the possible,” as one scientist put it, is why websites track the supercomputer race, which China is winning at the moment. “We should be concerned about that,” said Frederick Streitz, director of the lab’s High Performance Computing Innovation Center. Instruments are viewed inside the target chamber at Lawrence Livermore lab’s National Ignition Facility. Livermore was founded in 1952, during the height of the Cold War, to tackle national security challenges through science, engineering and technology. It was a formal naval base, and squat barracks remain on the property. Pilots in training were dunked into a swimming pool. The lab feels like a college campus or tech company. Cyclists take a break from research, likely pedaling past one of the many wineries in the Tri-Valley. Beyond the region, Livermore is among other leading national labs including Los Alamos in New Mexico and Oak Ridge in Tennessee. The groundwork for the government and private company collaboration was laid by passage of the Federal Technology Transfer Act in 1986. In industry circles, it’s widely referred to as “tech transfer.” And the shift is only intensifying. Read MoreWhy are American pigs dying? Government-funded U.S. science labs receive about $140 billion annually in taxpayer money. But even the most gee-whiz research is just that: research. Every federal dollar spent creating early-stage inventions in the lab requires $10 of private sector-funded development to generate a useful product. Plus, there’s no guaranteed return. Nailing a commercial solution or patent, after months or years of research, can be akin to winning the lottery. The stakes, meanwhile, for successful research only are getting higher. Beyond the growing intricacy of scientific problems, there’s a public perception that taxpayer-funded research should yield concrete results. This expectation emerged during the 1980s recession and has intensified in recent years, said Joe Allen, who helped create and pass the technology transfer legislation. “Virtually every government is saying that publicly funded research needs to be made into a practical benefit for its taxpayers,” said Allen, now president of Allen & Associates, based in Bethesda, Ohio. The firm specializes in managing public-private partnerships. The lab collaborates with big tech companies like Intel and Hewlett-Packard to smaller start-ups. And successful public-private relationships naturally require work. But culture among companies and government-funded labs can vary. Joint efforts mean altering workflows. “It’s hard to change behavior,” Livermore’s Streitz said. But challenges and high-risk can yield potentially big rewards. Lab work includes brain-focused research to treat soldiers and other patients for illnesses and injuries such as traumatic brain injury. Development of a neural device and bionic eye, or retinal prosthesis, largely have been government funded. The retinal implant received more than $75 million over 10 years. The project was conducted under a Cooperative Research and Development Agreement with private sector company Second Sight in Sylmar, California, and included researchers from several national laboratories. Several neural prosthesis projects have received some $8.1 million in federal funding. Also housed at Livermore is the National Ignition Facility or NIF—the world’s largest laser. It was built for $3.5 billion, and costs around $330 million annually to operate, including related programs. The facility has many roles, ranging from national security to advancing energy security. NIF scientists support nuclear weapons maintenance without underground testing—which has been abandoned. Researchers can instead duplicate the phenomena that occurs inside a nuclear device to manage weapons stockpiles. Experiments at NIF also are laying the groundwork to generate clean energy. The idea is to use lasers to ignite fusion fuel. “The government can pursue grand challenges that are difficult for private companies to do,” said Jeff Wisoff, NIF’s principal associate director. Lawrence Livermore scientists for the first time have experimentally re-created the conditions that exist deep inside giant planets, such as Jupiter, Uranus and many of the planets recently discovered outside our solar system. Researchers can now re-create and accurately measure material properties that control how these planets evolve over time, information essential for understanding how these massive objects form. This study focused on carbon, the fourth most abundant element in the cosmos (after hydrogen, helium and oxygen), which has an important role in many types of planets within and outside our solar system. The research appears in the July 17 edition of the journal, Nature. Using the largest laser in the world, the National Ignition Facility at Lawrence Livermore National Laboratory, teams from the Laboratory, University of California, Berkeley and Princeton University squeezed samples to 50 million times Earth’s atmospheric pressure, which is comparable to the pressures at the center of Jupiter and Saturn. Of the 192 lasers at NIF, the team used 176 with exquisitely shaped energy versus time to produce a pressure wave that compressed the material for a short period of time. The sample — diamond — is vaporized in less than 10 billionths of a second. Though diamond is the least compressible material known, the researchers were able to compress it to an unprecedented density greater than lead at ambient conditions. Such pressures have been reached before, but only with shock waves that also create high temperatures — hundreds of thousands of degrees or more — that are not realistic for planetary interiors. The technical challenge was keeping temperatures low enough to be relevant to planets. The problem is similar to moving a plow slowly enough to push sand forward without building it up in height. This was accomplished by carefully tuning the rate at which the laser intensity changes with time. The data described in this work are among the first tests for predictions made in the early days of quantum mechanics, more than 80 years ago, which are routinely used to describe matter at the center of planets and stars. While agreement between these new data and theory are good, there are important differences discovered, suggesting potential hidden treasures in the properties of diamond compressed to such extremes. Future experiments on NIF are focused on further unlocking these mysteries. Ignition — the process of releasing fusion energy equal to or greater than the amount of energy used to confine the fuel — has long been considered the “holy grail” of inertial confinement fusion science. A key step along the path to ignition is to have “fuel gains” greater than unity, where the energy generated through fusion reactions exceeds the amount of energy deposited into the fusion fuel. Though ignition remains the ultimate goal, the milestone of achieving fuel gains greater than 1 has been reached for the first time ever on any facility. In a paper published in the Feb. 12 online issue of the journal Nature, scientists at Lawrence Livermore National Laboratory (LLNL) detail a series of experiments on the National Ignition Facility (NIF), which show an order of magnitude improvement in yield performance over past experiments. “What’s really exciting is that we are seeing a steadily increasing contribution to the yield coming from the boot-strapping process we call alpha-particle self-heating as we push the implosion a little harder each time,” said lead author Omar Hurricane. Boot-strapping results when alpha particles, helium nuclei produced in the deuterium-tritium (DT) fusion process, deposit their energy in the DT fuel, rather than escaping. The alpha particles further heat the fuel, increasing the rate of fusion reactions, thus producing more alpha particles. This feedback process is the mechanism that leads to ignition. As reported in Nature, the boot-strapping process has been demonstrated in a series of experiments in which the fusion yield has been systematically increased by more than a factor of 10 over previous approaches. The experimental series was carefully designed to avoid breakup of the plastic shell that surrounds and confines the DT fuel as it is compressed. 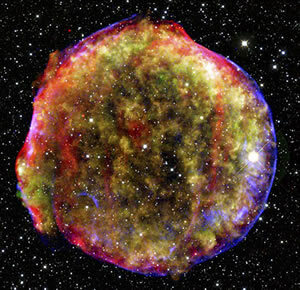 It was hypothesized that the breakup was the source of degraded fusion yields observed in previous experiments. By modifying the laser pulse used to compress the fuel, the instability that causes break-up was suppressed. The higher yields that were obtained affirmed the hypothesis, and demonstrated the onset of boot-strapping. The experimental results have matched computer simulations much better than previous experiments, providing an important benchmark for the models used to predict the behavior of matter under conditions similar to those generated during a nuclear explosion, a primary goal for the NIF. 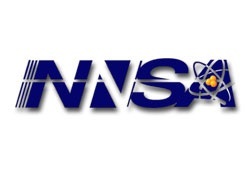 The chief mission of NIF is to provide experimental insight and data for the National Nuclear Security Administration‘s science-based Stockpile Stewardship Program. This experiment represents an important milestone in the continuing demonstration that the stockpile can be kept safe, secure and reliable without a return to nuclear testing. Ignition physics and performance also play a key role in fundamental science, and for potential energy applications. Hurricane is joined by co-authors Debbie Callahan, Daniel Casey, Peter Celliers, Charlie Cerjan, Eduard Dewald, Thomas Dittrich, Tilo Doeppner, Denise Hinkel, Laura Berzak Hopkins, Sebastien Le Pape, Tammy Ma, Andrew MacPhee, Jose Milovich, Arthur Pak, Hye-Sook Park, Prav Patel, Bruce Remington, Jay Salmonson, Paul Springer and Riccardo Tommasini of LLNL, and John Kline of Los Alamos National Laboratory. ” In the early morning hours of Aug.13, Lawrence Livermore’s National Ignition Facility (NIF) focused all 192 of its ultra-powerful laser beams on a tiny deuterium-tritium filled capsule. In the nanoseconds that followed, the capsule imploded and released a neutron yield of nearly 3×1015, or approximately 8,000 joules of neutron energy — approximately three times NIF’s previous neutron yield record for cryogenic implosions. 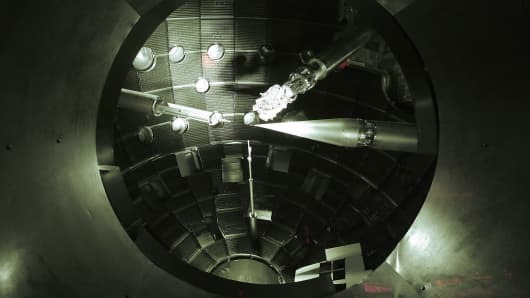 The preamplifiers of the National Ignition Facility are the first step in increasing the energy of laser beams as they make their way toward the target chamber. “A new employee will soon be added to the roster of those working on Level 2 of the National Ignition Facility’s (NIF) Target Bay. His name is D2T3, and his duties will be a bit different than his colleagues. D2T3 — named for the hydrogen isotopes that serve as fuel for NIF’s fusion targets — is a radiation-detecting, remote controlled robot. Currently in testing and training mode, he will be fully deployed in September after three years of development. System Manager Casey Schulz successfully running D2T3 through his paces, negotiating obstacles in the Target Bay. D2T3 has found his place in the NIF duty roster due to the continuing success of the facility’s experiments. 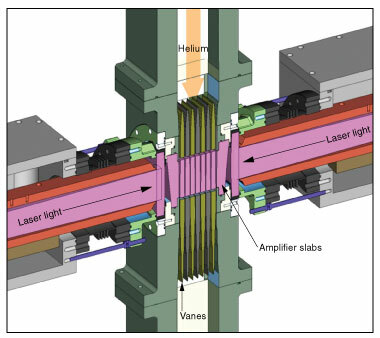 As NIF laser shots continue to yield higher and higher neutron yields — a marker of the facility’s ultimate goal, fusion ignition — the immediate environment of the Target Bay is inhospitable to humans. Currently, the area remains sealed for a number of hours based on radiation decay models before radiation technicians enter to verify that levels are safe. As a safety precaution, this wait is longer than models predict to provide a safety buffer. Camera faceoff between TID’s Matthew Story and D2T3 in TB Level 2. However, D2T3 doesn’t have the same constraints as his human colleagues. He can patrol the Target Bay immediately after a shot and measure the remaining radiation levels, providing an accurate and timely notification for when it is safe to re-enter the area. He also can provide real-time decay information, allowing for fine-tuning of the current models. “ A report issued by the National Research Council highlights the significant impact of successful development of inertial fusion energy (IFE), and recommends priorities for future research in this area. A view from the bottom of the chamber. Pulses from NIF’s high-powered lasers race toward the Target Bay at the speed of light. They arrive at the center of the target chamber within a few trillionths of a second of each other, aligned to the accuracy of the diameter of a human hair. Research into IFE is a key objective of Lawrence Livermore National Laboratory’s National Ignition Facility (NIF) — the world’s premier research facility in this area of science and technology. 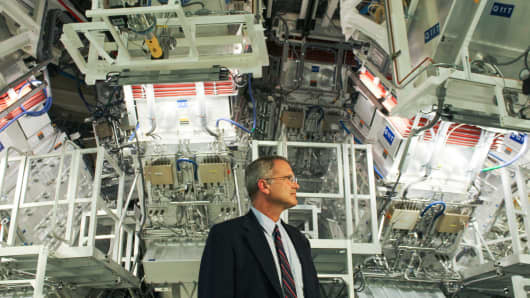 The NIF was built by the National Nuclear Security Administration (NNSA) primarily to provide data in support of its defense programs, but also has broad applications in basic science and fusion energy.